Started in 1975, the International Gemological Institute (IGI) is the biggest independent gemological laboratory in the world, with offices in all major diamond trading cities. IGI's mission is to provide the industry's professionals and customers with detailed, reliable expertise through education programs and by providing diamond and fine jewelry certification services. Every diamond is scientifically examined by several gemologists, who combine their experience with state-of-the-art tools to produce an exact description of the features of the diamond and the quality of its cut. A diamond's carat weight is measured with calibrated instruments. The color of a diamond is based on a scale from D (colorless) to Z (yellow) by comparing it to stones of a predetermined color. The amount of fluorescence is noted on a scale from None to Strong. A diamond's clarity is given by an expert gemologist using a microscope with a10x magnification loupe. Clarity is given based on a scale ranging from IF (internally flawless) to I3 (imperfect or heavily included). The diamonds characteristics are plotted on a diamond diagram. A diamond's finish includes factors as polish, symmetry, and proportions. Assigned a grade from Excellent to Poor, polish and symmetry are evaluated based on the quality of the polish and the precision of the cutting details. Proportions are evaluated based on the execution of the cutter's design, rating factors such as table diameter, crown height, pavilion depth, girdle thickness, and culet size, and is assigned a grade from Excellent to Poor.. 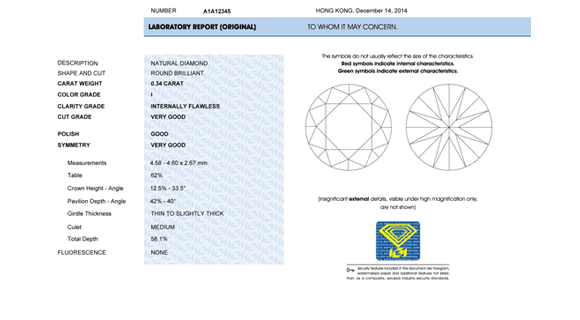 The IGI Diamond Report contains an analysis of the stone's features, including carat weight, color, clarity, polish and symmetry, and proportions. A diamond diagram with plotted clarity characteristics is also part of the report. 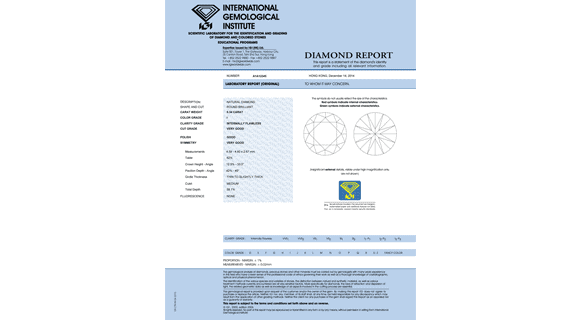 The IGI Diamond ID is a passport-sized document that has the same detailed information as the Diamond Report, without the plotted diagram. This report is also available in a more compact credit card size format.